Part 2 of three photos taken from the same exact spot. 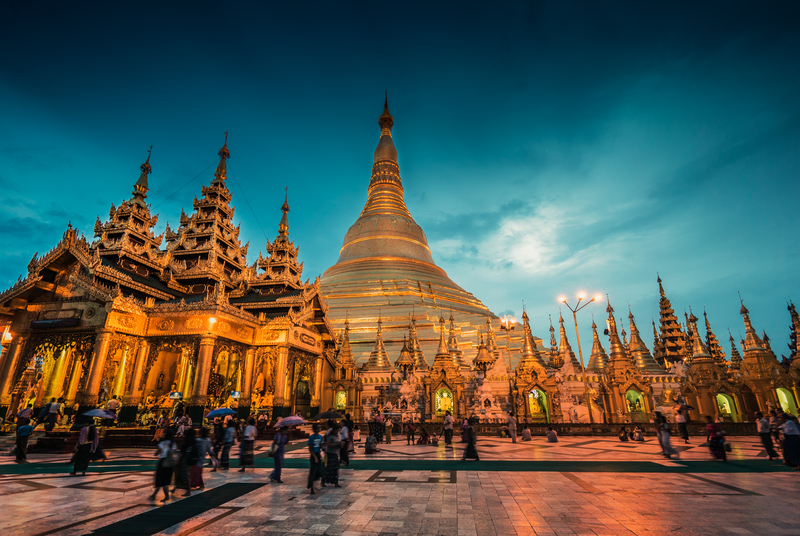 27 metric tons of gold leaf, thousands of diamonds and other gems and standing 99 meters high Shwedagon Pagoda is one of the grandest temples ever built. According to legend it was first built over 2600 years ago which makes it also one of the worlds oldest pagodas. Dedicated to Buddha and three of his predecessors this temple is believed to enshrine sacred relics such as parts of sacred robe and 8 hairs of Gautama himself. Definitely one of the must see places when visiting Yangon and Myanmar. I also took 987 other photos from that exact same location and will release a timelapse video when I get proper network connection. Tip: Go there well before sunset to have a stroll around before settling down to enjoy the sunset light slowly fading and golden stupa starting to glow in front of you.